OPENING RECEPTION, SATURDAY, NOVEMBER 10, 2018 from 7-9pm. Syracuse artist, Ellen M. Blalock is an accomplished multi-disciplinary artist who is known for her photography, video and fiber art. Ellen connects with the rich history of fiber arts found throughout the African Diaspora and her work is part of the African American quilting tradition of story quilts. 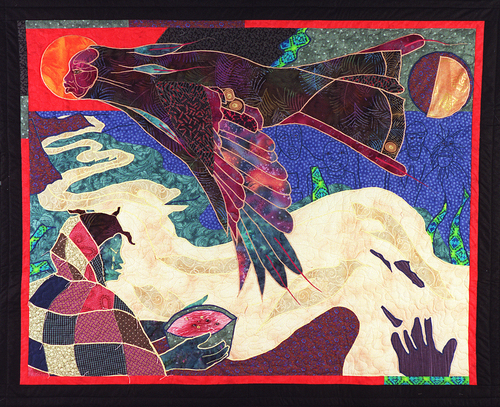 Stitching Stories includes a broad array of her quilting work from the past 20 years as well as the first three quilts from a new series of work dealing with mental health in the African American community. Ellen learned to sew at a young age often making clothes for herself and her family. In 1998, having just finished a family oral history project she decided to tell her own family’s stories through quilts and thus became a quilter. The collection of 25 quilts was exhibited at Syracuse’s Community Folk Art Gallery. 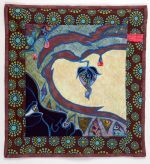 Ellen has continued quilting throughout her artistic career, taking commissions, and creating work for sale and exhibition. She has exhibited her photography and quilts extensively throughout CNY.